The POWER PEAK™ mounting system is designed for larger scale ground mount installations that require faster build rates. Optimized to site-specific conditions, POWER PEAK mounting structures assemble over pile driven galvanized “H” beams or C channels. The single row, vertical post design greatly reduces the number of ground penetrations while providing increased ground clearance options. 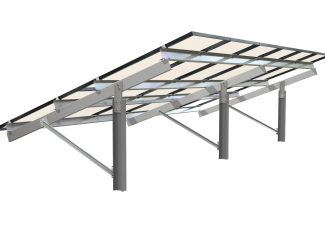 Also available in distributor kits with pre-assembled components, the POWER PEAK system provides a fast and secure mounting structure for most PV modules. POWER PEAK structures are assembled without lifting equipment and do not require field modifications, including drilling or welding. Pre-assembled components, including the patent pending module clamps, significantly reduce installation time and labor. Structures are designed and manufactured to match module string counts to reduce wiring time and materials. The unique module rails feature built in wire channels for a professional appearance.